« Where Do All the Guests Go After Breakfast? 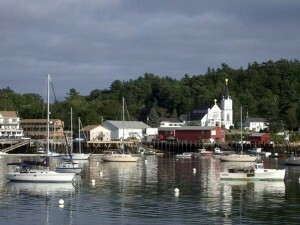 One of the favorite day trips from our Freeport Maine Bed & Breakfast is a trip to Boothbay Harbor. Often described as a classic Maine working harbor, you’ll find lobster boats, fishing boats, and, of course, boats for excursions to go whale watching, tour lighthouses, and more. As you finish your breakfast at Brewster House Bed & Breakfast in Freeport, Maine, turn left from our driveway on Main Street (US-1), and enjoy the drive through the countryside. If you get an early start, you may see a moose near the “Moose Crossing” signs just north of the town line. Continue past Brunswick and Bath, and pass through the lovely village of Wiscasset, where you may want to return later for a lobster roll at Red’s Eats, or a browse through the many antique stores, or just to enjoy the charming beauty of the riverside village. After crossing the river, you’ll come to a hill, and as you near the top, the sign says “Boothbay Region” to the right. Take Route 27, and enjoy the leisurely curves of the smaller road, out the peninsula. You’ll pass the Boothbay Railway Village, where you can learn some railroad history, or ride a small train. A bit farther along is the tiny village of Boothbay. Just down a side road from Boothbay is the Coastal Maine Botanical Garden, with its beautiful water views and spectacular flowers and plants. Returning to Route 27, continue into Boothbay Harbor. Entering town, the road becomes one way, and and is uphill from the town. This can be a good place to park, as parking is limited near the shops. Down the hill are the shops – some touristy, some local, some interesting. There are also art galleries and restaurants along the street and near the water. Walk down to the waterfront, where you’ll find a small park and the public dock, where you can enjoy an ice cream cone, and watch the boats come and go. Across the water is the Lobster Dock restaurant, as well as several lobstermen’s landing areas, so a good place for lobster awaits. When you finish enjoying the beautiful area, return once more to Brewster House for snacks and dinner at one of the Freeport restaurants, then a browse through the Freeport outlets. A nice day out!